Down a country dirt road just outside of Lapeer is the Eddy home. Inside the yellow house, on days when the Eddys are preparing for a farm market, the smell of nutmeg, cinnamon, cloves, cardamom and other spices spreads from the kitchen and permeates the air. The Eddy family, Stu and Michele and their two children, Theresa (Eddy) Sauvé and Shawn, sell fresh-ground, organic spices, as well as herb meat rubs, aged and flavored sugars, colored salts and peppercorns, homemade laundry soap and homemade bar soap at farmers markets throughout the Thumb under the name James Creek Sutlery. Michele began grinding spices for her own family about 10 years ago. “It tasted better,” said Michele. It’s better “starting out with any food as close to the way God made it.” In 2010, with the passage of the Cottage Law, the Eddy family decided to share their spices with others. “The whole purpose of it is to be a blessing to people,” said Michele. James Creek Sutlery’s process for grinding spices is fairly simple, though full of important details. The Eddy family orders organic non-irradiated spices in bulk, then hand sort each item to pick out gourmet quality spices for their final product. Some spices, such as nutmeg meet the Eddy’s specifications on a regular basis. Michele said she has never had to throw out a nutmeg. But, other spices, such as vanilla, have much lower yields; the Eddys only consider about 20 to 28 percent of the vanilla they buy to be of high enough quality to sell. “If it’s not good enough for my family, it’s not good enough for your family,” said Michele. After sorting the spices, most are then ground by the Eddy family. James Creek Sutlery has separate grinding bowls for different types of spices and each is kept cool while grinding to avoid losing essential oils. “When we grind it, they (essential oils) are dispersed, and that’s what tastes so wonderful, said Michele. Once suitably ground, each spice is then hand sifted to remove any larger chunks. For some spices this is simply an issue of consistency, for others, such as Saigon cinnamon, it is an issue of safety. Saigon cinnamon is very hard and could harm a consumers tooth if not sifted properly. 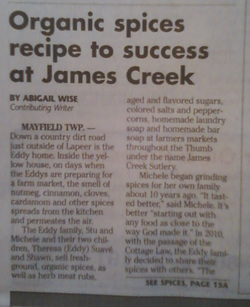 Sifted spices are then either bottled or used in one of James Creek Sutlery’s spice blends. One of the Eddy family’s favorite sugar and spice mixes is called Sweet November. It is a mixture of their signature Five Part Harmony, Michele’s husband’s original blend, and pure (raw organic) cane sugar. Because it’s a family favorite, the Eddy’s named it in honor of Stu and Michele’s wedding month. Accountability is very important to the Eddy family. Michele said everything they do is for the glory of God, so they put their best effort into their business. “In everything give thanks,” a quote from First Thessalonians chapter 5, verse 18 in the Bible, is printed on each bottle sold by James Creek Sutlery. Like every other part of the business, the bottles used at James Creek Sutlery were selected with great care. The Eddys wanted bottles that were historically accurate, a convenient size and that allowed the essential oils in the spices to expand and contract as needed. “We wanted to provide the absolute best packaging that could be,” said Michele. After much experimentation, they finally settled on several different bottles. One is a replica of a century year-old spice bottle and Michele’s favorite is a small apothecary bottle that she later found out was approximately equal to a shekel. Recently, the historical accuracy and health benefits of James Creek Sutlery’s products were recognized by an invitation to the Henry Ford Museum’s Maker Faire.